hope you all had an enjoyable weekend and a wonderful father's day! i had dinner with my dad and immediate family, had a customarily loooooong conversation with my extra father, and i will be enjoying the company of my extra parents this week when the wieringos stop by for a few days during their summer excursion up through the northeast! here's a pretty cute prank that was sent to me by alison! 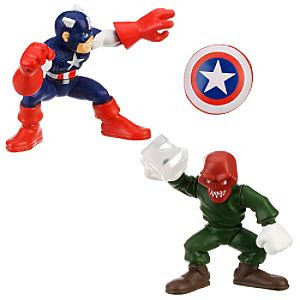 --a captain america--with cool shield accessory--and red skull--with also cool cosmic cube! at this point, realizing that i do have a collector's mentality (i try to fight off my urges to collect 'em all!,)--still, i like to have the characters i've written and the figures that are just...too cool! so i ask you...who have you got? how many have you got? how super is your squad? and colin swung in valiantly and got that! 2. "don't run back inside, darlin', you know just what i'm here for. so you're scared and you're thinkin' that maybe we ain't that young anymore..."
turned around and let him go." 4. "when are you gonna come down...? when are ya goin' to land...?" 5. "if there's a bustle in your hedgerow, don't be alarmed now..."
Just what exactly is Cyclops pointing at? Looks like he's saying, "WOAH! Can't touch this!" Action figures have always been a weakness of mine. I'd buy them all if I could. Unfortunately, I ran out of space a couple of years ago so I had to stop buying them and ended up giving about half of them away at a kid's carnival at work. Broke my heart until I saw the kids playing with them. I've still got the animated Spider-Man figures but it's only a matter of time before I let those go too. I reeeeally want a complete set of those cool Justice League Unlimited figures in the Bruce Timm style and the figures from the DC New Frontier designed to look like Darwyn Cooke drew them. 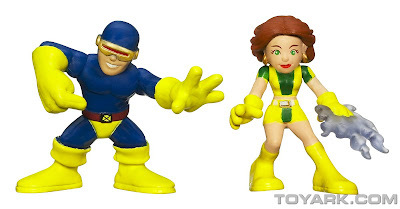 The Kirby-style New Gods figures are cool too. I've got a ton of SHS figures! Love those things! Most of them are officially my sons... but I keep 1 Cap and 1 Thor on my desk at all times. Between the two of us, we probably have 12-16 figures. While those Super Hero Squad figures are just the cutest things ever, I have been successful in fighting the urge to buy them. Just no room left in the house for any more "collections" and, for those wise guys out there who say, buy a bigger house, I'm getting to the stage where I'm thinking about down sizing, not expanding. 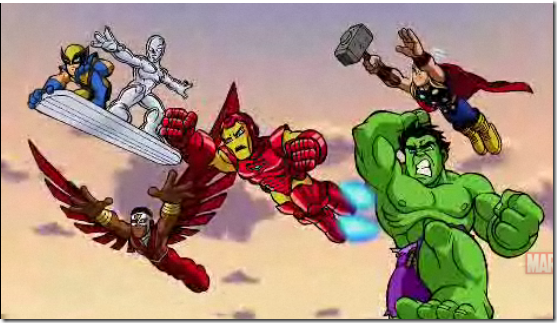 I am, however, collecting the Super Hero Squad comics and I'm enjoying those immensely. Same here, Brian. And, yeah, those Squadie comics are fun! My son, Daniel, LOVES the "Squadies"
Odds are I've gotten some of those mixed up... and his sister has laid claim to all the girl characters. from other parts of the body, and then the belly.